The video tutorial is below if you prefer to take a look at that. If not, just scroll down for the written tutorial! Begin in your underground area where you would like grass to be. Make sure the entire area you would like to turn into grass is covered in dirt, otherwise it won't work! If you know what's above you at ocean level (coordinates y:64), and which direction to dig towards, then great—you can use this to your advantage! Start digging out your staircase and head all the way up until you reach grass. Be sure to place torches as you're working your way up, as grass needs a light level of 9 or above in order for it to grow! I dug my staircase so that it was 3 blocks wide, but you can make yours as wide as you would like! The wider it is, the faster the grass will grow. 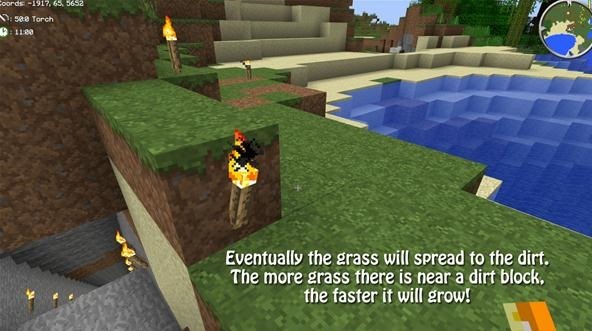 When there is more than 1 block of grass near a dirt block, the grass will spread faster. 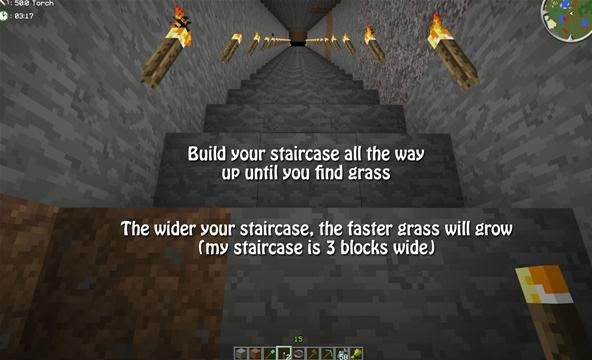 So keep this in mind when decided how wide you want to make your staircase. If you are like me and hit sand by the time you get to the top—don't freak out! All you need to do is find a grassy area and start replacing all of the sand next to the grass with dirt. Allow the grass to spread to the dirt, all the way to the entrance of your staircase. Don't forget to place torches at the top, as well, otherwise the grass will not spread to the dirt unless the sun is in the sky! Eventually, the dirt you placed down in the sand's place will turn to grass. Make sure the front of your staircase has grass in front of it so that we can lead the grass down the stairs in the next steps! 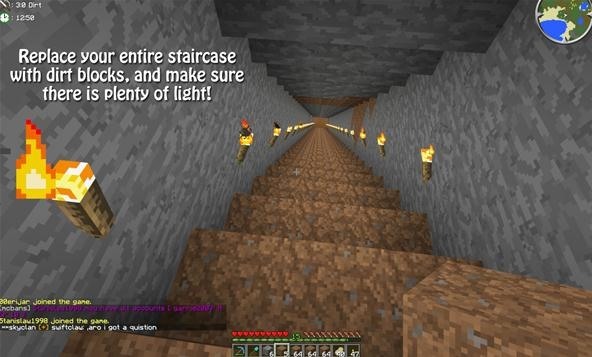 Go back to your staircase and bring a pickaxe! 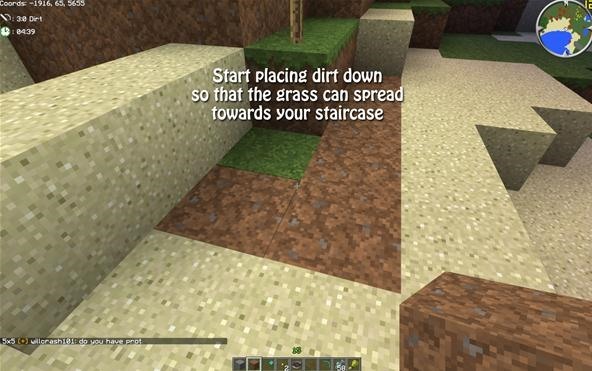 Start replacing the entire staircase with dirt blocks. Now, you unfortunately have to play the waiting game. Wait for your grass to spread from the top level all the way to your underground house! Feel free to start wrangling sheep together (don't forget your wheat), play tic-tac-toe, or hop around in circles like I did! You will need to stay near your grass while it's growing in order for the grass to spread, so don't wander too far! My grass took about 40 minutes for it to go from ocean level (64) to level 20 underground. Keep in mind that my staircase was 3 blocks wide, so it did go a little faster than normal. Every server is different when it comes to grass growth, so you may have to wait longer than I did. Another way to get grass underground is by using a Silk Touch enchanted pickaxe. If you have an XP farm, that is great news! If you do not have one, but are looking to make one, check out this tutorial on how to do so! Silk Touch is honestly the easiest way to get at levels 21-24 if you have a diamond pickaxe. I personally always enchant at level 24 experience for Silk Touch. Level 50 has a 14% chance of getting it, but level 50 takes a very long time. A level 24 enchant has about a 8.7% chance of getting Silk Touch, making it the best option. 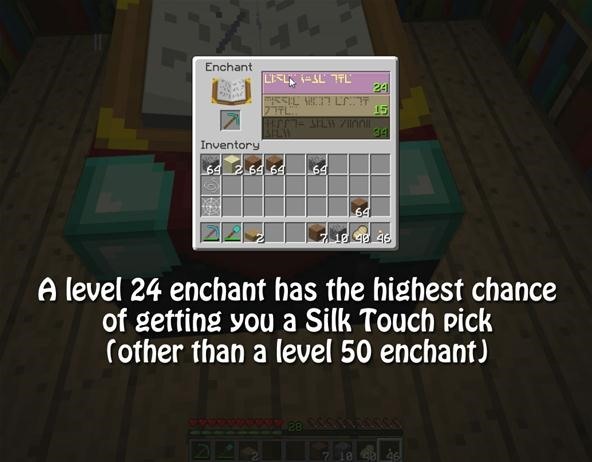 No one should ever waste a level 50 enchant when they're trying to get Silk Touch! If you do get a Silk Touch pick, all you need to do is mine some grass! 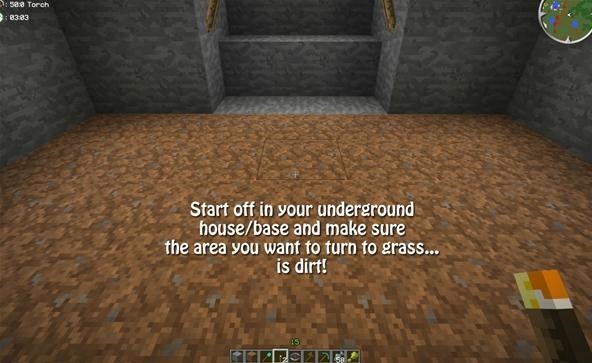 Once you have the grass blocks, just go to your underground base/house and place it in the middle of your dirt room! You canfarm enough grass blocks for your entire floor, but I personally think it's wasteful, just because it is kind of hard to get a Silk Touch pick. Did you know about these methods already? 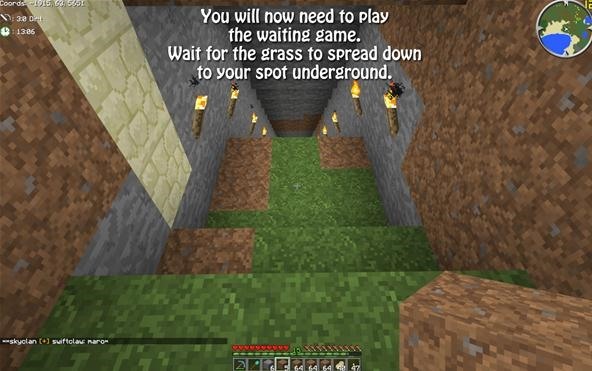 How much better is your underground house going to look with grass?! 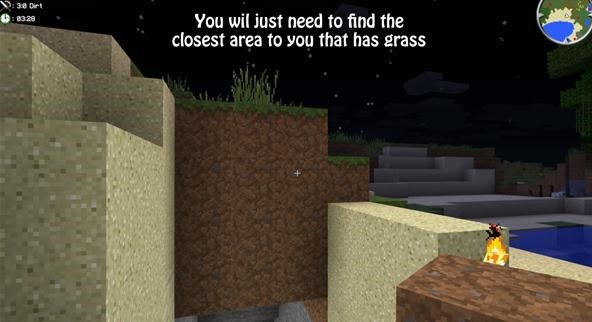 Did you know that if right under a grass block there is air and then dirt the grass will go down. Yeah, this does happen but it's usually very rare. Animals will generally spawn if the light level is 9 or above (the level you need for grass to spread). The thing that makes it rare is that it depends on the current 16x16 chunk you're standing on. If there are a lot of animals already on that chunk, they will most likely not spawn underground. 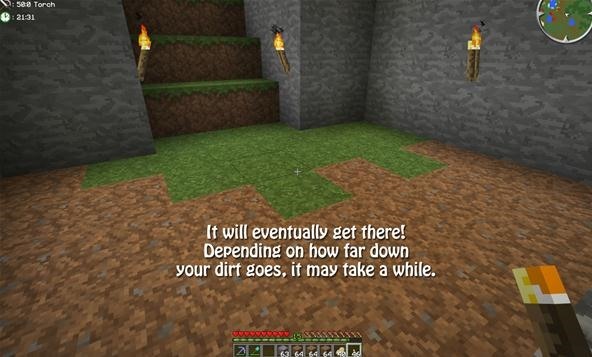 Also, if animals do spawn - they will generally show up above ground instead of underground. So, it's actually hard to do depending on what server you're on. It just depends on the settings of the server and how many passive mobs are allowed to spawn per chunk. I would love to see some ultimate traps tutorials. 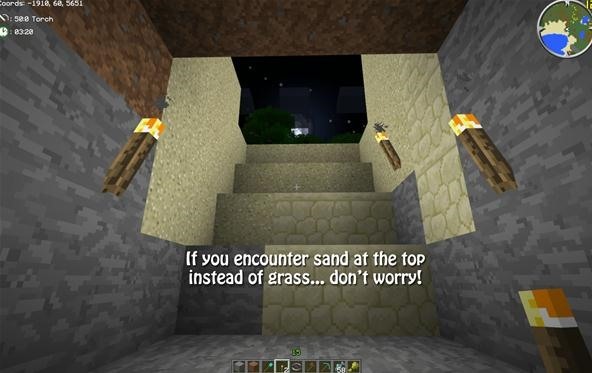 Or instead of the stair case, (If it's on a pvp server and you don't want a tunnel to be found) you could dig a tunnel straght down to it and place a dirt block every other block. Then the grass goes down block bye block!